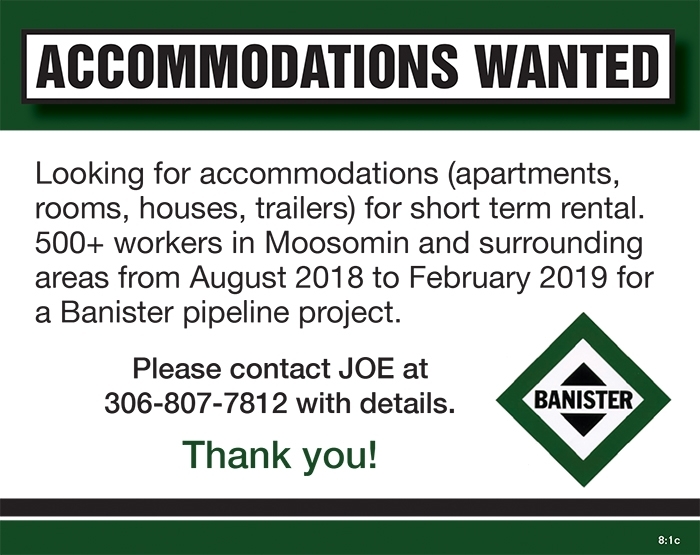 With the first workers for the Enbridge Line 3 replacement starting to move into the Moosomin area, and construction set to ramp up over the next few months, Enbridge and Banister, the contractor overseeing the pipeline replacement, have made it known that they are looking for accommodations for the workers who are moving into the area and looking for short-term stays. According to Joanne Bradbury of Enbridge, each individual will choose a location and a budget that suits them. She says Enbridge does not arrange accommodations for the crews working on the pipeline, however they do pass on any information that they do have about available accommodations. Because workers are bussed to the pipeline right-of-way each day from the yard site in Moosomin, she says there will be a big need for accommodations in Moosomin, however some people will also likely stay in other nearby communities. 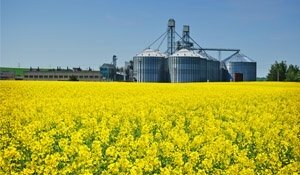 “Some folks would be more than happy to stay outside of Moosomin while others will want to stay in Moosomin, simply for the fact that they have to get to the yard every day,” she says. “If you are an early bird and you have no issues with getting up half an hour early so that you can get on the yard and get on the bus to get out to the right-of-way by 7 am, then you’re laughing. But if you’re someone who likes to sleep, then you are going to want to stay in Moosomin because it just gives you that much more time. 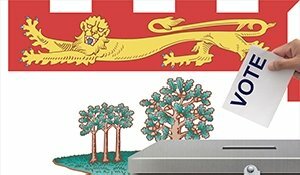 “We recognize that with approximately 800 people trying to find a place, not everybody is going to be in Moosomin, they are going to be all over the place. The focus is all over. The further out you go from the core, which is Moosomin, the odds get less and less, but I think within close proximity they will still be fine. So what kind of accommodations are workers looking for? That can vary depending on the person, but Bradbury says it’s almost always important that the accommodations be furnished. “Most will be looking for fully furnished rentals,” she says. She says some people are willing to share accommodations and amenities with others, while some people like their privacy. The other option, she says, is allowing some workers to park their RVs and stay, but she stresses that’s only okay if it’s okay with the community. According to Enbridge there are a variety of workers on this project. Many will be looking for short-term stay options (four to six months maximum), although some workers will stay on for longer. Enbridge recommends that rental rates align with whatever the rental market calls for in each community or region. Most workers on the project will be looking for all the rental amenities consistent with a 10- to 12-hour workday. Once Enbridge has the information, they will add it to their listings, which are shared with the crews in the area. If a project worker is interested, they’ll contact the person offering the rental directly. Bradbury says people who have accommodations to rent can email projects@enbridge.com, or they can refer to the ad from Banister at the bottom of this page and contact Joe at 307-807-7812. With a high vacancy rate in their family housing units, Moosomin Housing Authority has decided to provide some housing units for pipeline workers. “They obviously have to pay the maximum rent, but we’ve provided a designated number of houses for them,” says Sheilagh Garrett, manager of the Moosomin Housing Authority. Garrett says the six designated homes have already been spoken for. “One house already has Banister people living in it and they are rented as needed as Banister moves in, so we have another one going September 1, another one going October, and then a couple more in November,” she says. Garrett says the MHA board made the decision to provide accommodations because the vacancy rate in Moosomin is so high right now. Filling the houses helps taxpayers, as the pipeliners not only pay rent, but also the cover the cost of utilities which would be a cost to the housing authority if the houses were vacant. There have been 16 new applications for social housing in the last month.